Hankering for true smokehouse flavor? You’ve arrived my friend, the Weber 721001 Smokey Mountain Cooker 18-Inch Charcoal Smoker in the solid Black color, is a premium charcoal smoker, featuring 2, plated-steel grates for cooking, and 481 square inches of prime retail, culinary space. A water pan and built-in thermometer allows for stress-free heat monitoring, and a spring-loaded latch on the handy, no rust aluminum door gives easy access to the charcoal chamber. Sounds minor, but this last detail is a real gem in the smoker world. Those in the BBQ meat smoker world know a thing or two because they “smoked” a thing or two … actually many different types of meat and they always come back home to this one. George Stephen is the man behind the Weber grill, and he lived and breathed T.I.P.S. It starts with Tradition, grills fabricated to exceed customer expectations and done so with a family/friends experience in mind. Second is Innovation, a Weber trademark from the kettle to heat dampers, and electronic temperature modules. Performance is in line with tradition, a Weber trademark that always scores at the top. Lastly, Service, a Weber calling card. You won’t find a better customer and dealer service center, hands down. The Weber Smokey Mountain Cooker is a hotbed of features that will leave you thanking everyone from your neighbor to the dog down the street that you pulled the trigger on this smoker. The built-in thermometer, perhaps rather pedestrian in the features world, is anything but. Super durable, it is one of the best on the market, and a chef’s best friend. The water pan is porcelain-enameled, ladies and gentlemen. Sound fancy, you bet! Plus it adds much needed steam to the whole process so your precious cuts stay tender and moist. Lastly, the grates are as heavy-duty (steel) as they come, and provide lots of room to either roast or smoke ribs simultaneously. A similar refrain was heard elsewhere, namely the 18 inch being too much smoker for your average weekend warrior. An issue with the aluminum also came up with this woman, “The REAL issue for the smoker, and why I didn’t give this 5 stars it the door. Cheap aluminum. The fit is horrible. Almost falls off. This was an isolated comment, so it might be safe to assume she just received a clunker. All-in-all this Weber smoker scored very high with 4.7 stars out of 5 from close to 1,987 customer reviews and 97% of those reviewers scored it a 5-star! That is darn high in our book! 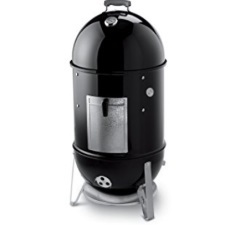 Click to see the current price for this Weber smoker. This Weber Charcoal Smoker is a fine piece of culinary machinery. The only critique that more than one reviewer had was it was too big and powerful for small get-togethers. Yet the price-tag is quite accessible so even if it’s too big, go for it, you can always cook for more folks, and having less food at the end of the day would be the real bummer.